Global filters are created using the Quantity filters option in the drop-down menu that appears when the button of the “Job item assignment and quantity extraction” dialogue box is pressed. Filters by assignment allow users to obtain quantities only from elements that meet specific requirements. Filters created by assigning job items to entities are saved by categories. Filters of this type are created based on the element parameters. Once a job item has been assigned to a Revit entity or vice-versa, filters can be carried out by assignments. If, for example, users wish to filter elements whose length is less than 12 m, they must first press the button and, in the “Select a filter to limit the elements to be measured” dialogue box, add the filter. The Design options consist of design alternatives which, by always working on a single model, allow users to save a substantial amount of work. For example, two or more proposals can be carried out simultaneously to show clients various alternatives. Therefore, Arquimedes’ new “Design options” tool allows users to only measure Revit entities which belong to the design options selected in the Revit model. This tool permits users to extract different quantities depending on the quantity options that have been created in the Revit model, to obtain different quantity values. 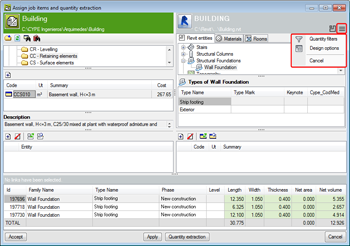 The button, in the “Job assignment and quantity extraction” dialogue box, allows users to access the “Design options” (if design options have been created in the Revit model) and select the group of design options to apply when extracting quantities to create the bill of quantities. To help to alternate between the “Job item assignment and quantity extraction” and “Linked job data” dialogue boxes, the button has been added to both dialogue boxes. The F7 key also carries out the same alternating function between the dialogue boxes. In the “Job assignment and quantity extraction” dialogue box, the button allows users to access the Global quantity filters and the Design options. In the “Linked job data” dialogue box, the button allows users to access the “Find element by ID” option. As well as the new features and improvements that are indicated explicitly in each CYPE software version update, these updates also include process optimisations which imply internal improvements of our programs. Systematic checks are carried out on all the programs in each revision, as well as changes which improve their operation. Therefore, we recommend all our users (in this case of the 2016 version) to always update their program version to the latest available version, regardless of the country CYPE software is being used for or the language in which the program is installed.